If you cook a lot, having proper ventilation is essential to protecting your kitchen from grease, odors, smoke, heat and moisture. Moreover, over time grease and moisture collect on the cabinets and appliances, making cleaning difficult and eventually causing ugly yellowish stains. Having a range hood with prevent this from happening and will preserve the beautiful look of your kitchen. Installing a quality hood vent will minimize the negative side effects of the cooking process. There are a number of different vent types to consider, based on your kitchen design, cooking frequency and budget. 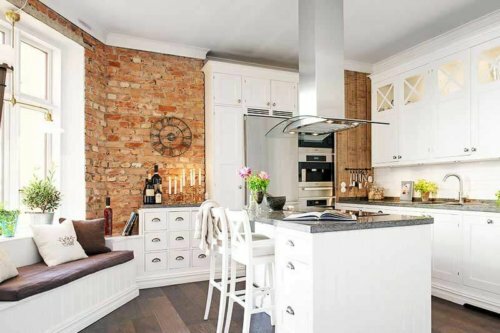 If you are replacing an old range hood, it makes sense to go for the same exact type. However, in a new kitchen remodel, your options are wide open. This is the most common and popular type, as it is budget friendly and versatile. An under-cabinet range hood is installed right under your cabinets, above the range. The majority of under cabinet hoods are ductless; they recirculate air back into the kitchen. It is possible to get models with ducts that will transfer the smells and grease outside of the home. While these are a lot more powerful, they cost more and are also more difficult (and expensive) to install than ductless models. 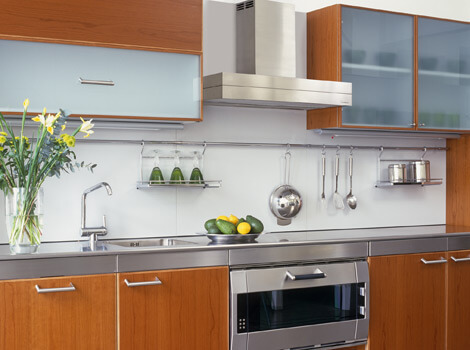 If there are no cabinets above your range, then you will need to install a wall mounted range hood. Their design resembles the look of a chimney, hence the name ” wall mounted chimney”. These models usually stretch the full length of the stove and cost more than the under-cabinet ones. If you have a range as part of your island (or want to design your kitchen this way), then you will need an island mount range hood. These models hang from the ceiling and usually require a system of ducts in place, but some are ductless. Many people choose to install it over the kitchen island even if the range is not there. 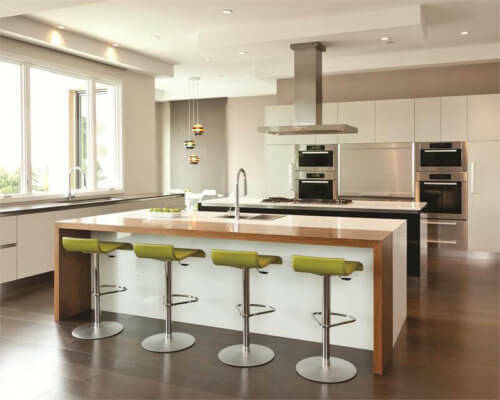 They love the sleek, modern look of the island range hood and want it to be a focal design point of the kitchen. 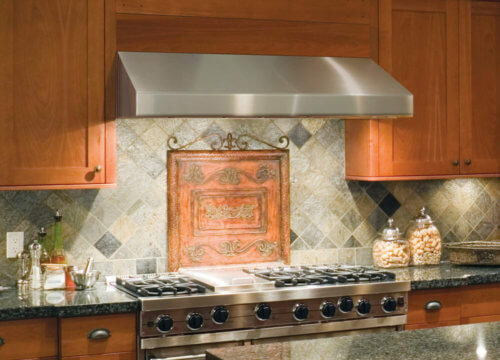 These are the most important specs you should evaluate when shopping for a range hood. This is the measure of the amount of power a range hood has. The higher the CFM number, the more air the hood will remove in one minute of operation. By far this is the most important feature to consider, if you want the vent to do its job properly. Obviously, if you cook all the time, you need a high CFM number. Also, if you have a large six-burner gas range, you need a very powerful vent with a very high CFM. For a gas range, the CFM should be between 600-1,200. By contrast, if you have an electric stove, you can get away with a lot less, only 300-450 CFMs. Its not advisable to get a model with a lower than 250 CFM, unless you really don’t do a lot of cooking. ductless hood ranges are more common and budget friendly, but they are not as powerful or effective, because they simply recirculate air. Models that require a duct system to already be in place or to be built are more expensive but also a lot better, because they bring the odors, smoke and grease out of the house. Not only is the vent itself more expensive, it will require more complex and costly installation. Note, if you are planning on having a ducted exhaust system, it is best to mount your hood to an exterior wall. This way, you will require a shorter system of ducts, which will be cheaper and easier to install. The blower part of the fan can be in three different areas, which also effects the level of noise. 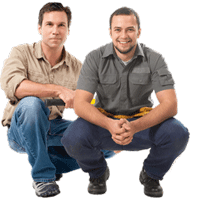 Inline blower: sits halfway in the duct run, either between ceiling joists or in the attic. It is also possible to add an inline blower to the main one, to increase its power. Exterior blower: this option is most common in very expensive hood ranges. Often it needs to be custom built, in combination with the proper fan product. The blower can be mounted to any exterior wall or part of the roof. This system offer the most quiet operation. This is an important feature to ensure that the hood vent will be efficient. The width of the fan should be equal to the width of the range. Its depth should cover the back burners and at least half of the front burners. As a rule of thumb, the higher the hood from the range top, the LESS effective it is. Of course, you don’t want to be hitting your head, so keep this factor in mind when determining measurements. Overall, you compensate for extra height by increasing CFM and/or coverage (width and depth). To ensure that your vent will work well, you need to clean the grease filters from time to time. We recommend buying a product with stainless steel grease filters. They can be easily removed for cleaning and are dishwasher safe. Mesh trap: these are most common and are made of either aluminum or steel. They can be very effective but need to be cleaned on a regular basis, so they must be dishwasher safe. If these traps get clogged, they will reduce air flow and the vent will not work efficiently. Baffle trap: this is an ideal option, available in more expensive models. It effectively traps grease without reducing or blocking air flow. It also needs to be dishwasher safe. It is made of rigid material and will always keep its shape, creating a high-end, professional look. Cup trap: this type is very rare and is available only in very few models. When it comes to grease traps, the most important thing to keep in mind that there is a REAL risk of a FIRE HAZARD if you don’t keep it clean. A drop of grease that gets into an open flame can start a fire! If you are not going to install a hood range with an external blower, get one that has a special carbon filter for recirculating air. This filter cleans the air that comes up, traps the by-products of cooking, and releases the air back into the kitchen odor and grease free. Keep in mind that you need to regularly replace this filter. Depending on how much you cook, you may need to get a new one every 2-6 months. While its true that some vents are very noisy, it does not have to be the case. If noise is very important to you, look for a range that has a quiet sound output (it is measured in sones). In the store you may not easily find this measurement on the ticket label. It is best to stand next to the appliance and test it out. Keep in mind that fans with greater power will generally be more noisy. However, at the same time they are more effective at their job. It goes without saying that stainless steel is the best choice, offering both great aesthetics and durability. While it is more expensive, it is well worth the investment. Many premium models also feature glass components in addition to stainless steel. The most high end hood ranges can also be made out of copper (this can cost thousands of dollars). If you cannot afford real copper, but really love the look, you can consider more moderately priced models ($500-700) that have a copper finish. If you are looking at pricier models of hood ranges, you will find that they come jam packed with cool extra features. These include LED lighting, illuminated touch screen display, remote control, delayed shut down function, heat sensors, variable speed fans and more. All these extras may seem very desirable, but the truth is they are not critical to the performance of the hood range. So, first settle on the features that matter most and then pick and choose the extras you don’t mind splurging on.